2. What’s it like to use? Reports of BlackBerry's demise have clearly been exaggerated, as the business-focused phone maker has just released another high-end Android smartphone, despite claims that it was moving away from hardware towards software. While the DTEK60 is indeed a new device bearing the BlackBerry name, the production has been outsourced to Chinese firm TCL, which also works with the likes of Alcatel and Vodafone. It's packing a 5.5-inch QHD screen, a Snapdragon 820 chipset, 4GB of RAM, a fingerprint scanner and 21MP main camera. That’s a strong assortment of specs, and the DTEK60 aims to stand out further by offering a suite of security-oriented apps and features which, according to BlackBerry, make this one of the most secure phones money can buy. That’s a good thing too, because at $499 (£475, around AU$650) the sheer strength of specs may not be enough to compete with the likes of the Samsung Galaxy S7 and HTC 10. 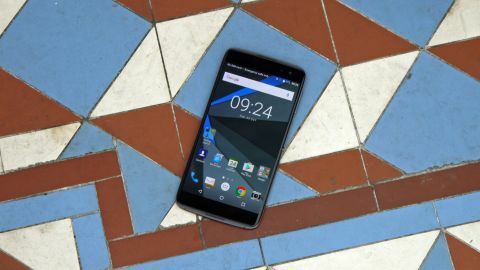 With BlackBerry essentially handing over design and construction duties to hardware partner TCL, the DTEK60 feels more like a traditional Android smartphone that any other device to bear the famous BlackBerry logo – including the Priv and DTEK50, both of which also run Android. BlackBerry is clearly gunning for the same sector of the market that laps up phones like the Samsung Galaxy S7 Edge and Google Pixel XL, and it shows in the core design and feature list of the DTEK60. There's no physical keyboard here – BlackBerry is slowly abandoning the one feature that truly set its phones apart from the competition – and in its place we have a roomy, 1440 x 2560 AMOLED screen which measures 5.5-inches from corner to corner. Inside the phone there's a Snapdragon 820 processor – the same tech that can be found in flagship devices such as the Galaxy S7, Xiaomi Mi5 and LG G5 – as well as 4GB of RAM and 32GB of storage. The presence of a microSD card slot means you can add in more memory if you wish. NFC is also included, so you can make contactless payments via Android Pay. For such a security-centric company it's perhaps surprising that BlackBerry hasn't included a fingerprint scanner on any of its previous phones. There's one on the DTEK60, and the good news is that it's fast, responsive and permits users to unlock the device with a single touch of their digit. Like so many Android handsets, the DTEK60 has its scanner located on the rear of the device, where your finger naturally lies when you hold it in your hand. Above the scanner there's a considerable camera bump, which contains the 21MP snapper. It's rocking phase detection autofocus and a dual-tone LED flash, but sadly lacks optical image stabilization. The front-facing camera is an 8MP, fixed focus variant and is perfect for selfies thanks to its LED flash. While the DTEK60 is running a largely stock version of Android 6.0 – which means it's close to the user experience you'd get from a Nexus (or Pixel) device – it does come with some neat extras which focus on business users and general security, including the DTEK app, which monitors the handset and its running applications, warning you of potential risks and weaknesses. A 3000mAh battery keeps things ticking over and provides enough stamina to last an entire day. Quick Charge support means you can completely fill the battery from empty in just over an hour, or alternatively you can grab a few hours of battery life by hooking it up for a 15-minute charge. At 6.99mm, the DTEK60 is the thinnest BlackBerry yet. The front of the phone is covered in 2.5D glass, while the rear features hardened plastic and the familiar BlackBerry logo. You'll also find the fingerprint scanner and 21MP camera on the back, the latter of which protrudes quite dramatically from the body of the device. Around the edges there's a metal frame with neatly beveled edges, as well as the power button on the left-hand side, and volume rocker and "convenience button" on the right. On the topic of the power button, we think it's in an odd place – the top corner of the left edge – and we repeatedly found ourselves stabbing the convenience key instead, a possible throwback to the days when we owned a Sony Xperia. Muscle memory aside, there's no doubting that the button's positioning is weird – but not disastrous, as you can use the fingerprint scanner to wake the phone from sleep. On the top of the DTEK60 there's the 3.5mm headphone socket and on the bottom end the USB Type-C port. Despite substituting tempered glass for plastic on its rear, the DTEK60 is still quite a slippery beast. During the review period, our handset actually slid right off the desk and onto the hard floor, so we'd recommend getting a case early on. On the positive side, the phone survived this heart-stopping fall with just a few nicks on the corners, so it's clearly solidly built – which is impressive for such a svelte device. It may be made by an external company, but there's still plenty of BlackBerry's DNA in the design of the DTEK60. The curves remind us of the iconic Bold series, while the convenience key will be instantly familiar to long-time supporters of the brand. You can assign it different roles – we use it to instantly launch Google Now, for example – and after a few days in the company of the DTEK60 we found ourselves wishing that more phones boasted such a button. Being able to instantly launch an oft-used app from any screen is a lot more useful than it might sound on paper. For a company which for many years forced its users to stare at awkward landscape-oriented displays, BlackBerry has certainly embraced the big-screen mobile revolution. The 5.5-inch panel on the DTEK60 has a pin-sharp resolution of 1440 x 2560, which gives it a pixel density of 534ppi. Thanks to the fact that it's an AMOLED screen, colors look bright and punchy, while overall contrast is striking. While Samsung fans are used to such visual opulence and we dare say the panel on the S7 is superior, this is arguably the best display to ever grace a BlackBerry device. Next Page What’s it like to use?